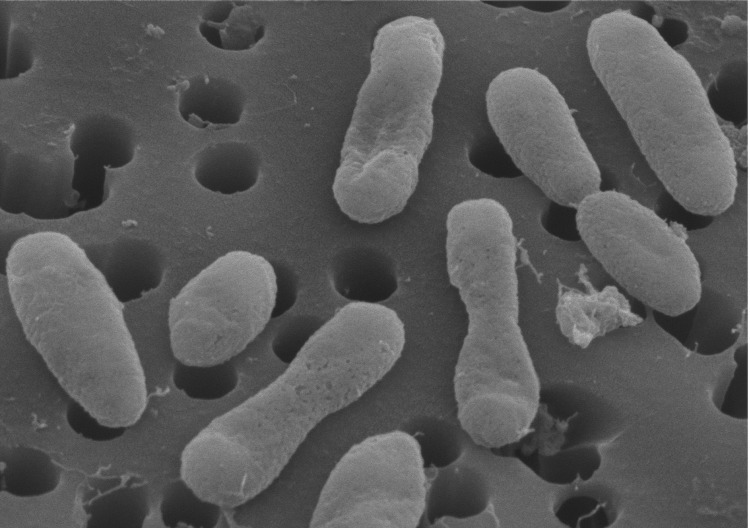 Bacteria belonging to the Roseobacter lineage of marine Alphaproteobacteria account for a substantial fraction (ranging ~10 – 25%) of bacterioplankton cells in surface ocean seawater [1-4], making them one of a relatively small number of suitable targets for scientists investigating the ecology of abundant marine bacterial groups. Focused genome sequencing efforts have provided significant insights into the functional and ecological roles for this group [5-7]. 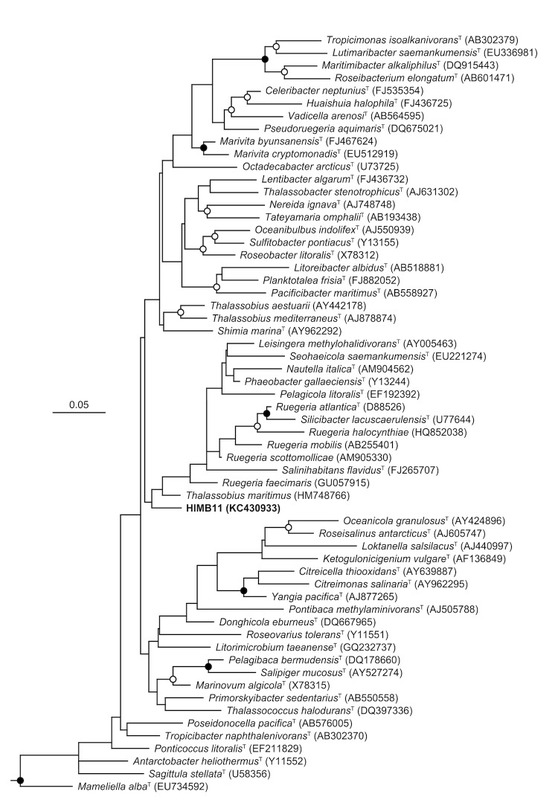 In 2004, the first member of this group to have its genome sequenced, Ruegeria pomeroyi (basonym Silicibacter pomeroyi) strain DSS-3 , revealed strategies used by the Roseobacter group for nutrient acquisition in the marine environment. To date, over 40 genomes have been sequenced from members of the Roseobacter lineage. Comparative analysis among 32 of these genomes indicates that members of this group are ecological generalists, having relatively plastic requirements for carbon and energy metabolism, which may allow them to respond to a diverse range of environmental conditions . For example, members of the Roseobacter lineage have the genomic potential to obtain energy via oxidation of organic substrates, oxidation of inorganic compounds, and/or sunlight-driven electron transfer via bacteriochlorophyll a, proteorhodopsin, or xanthorhodopsin phototrophic systems. Genome analyses as well as culture experiments have also revealed a variety of mechanisms by which roseobacters may associate and interact with phytoplankton and other eukaryotes. These include genes involved in uptake of compounds produced by algae such as peptides, amino acids, putrescine, spermidine, and DMSP [10,11], as well as genes for chemotaxis, attachment, and secretion . 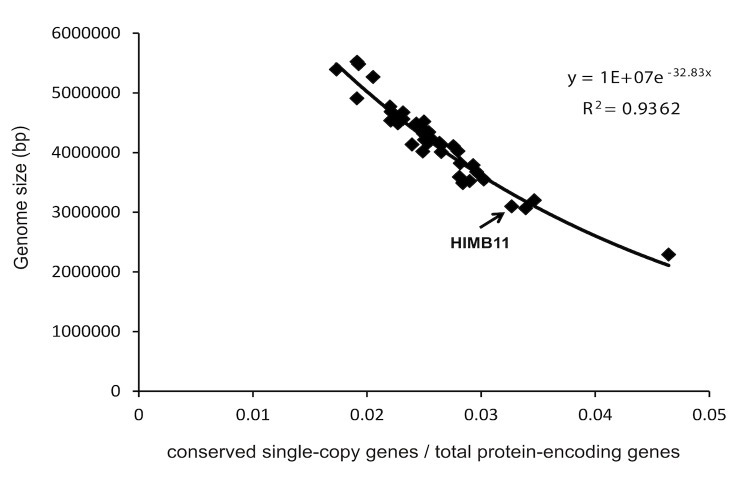 Comparative analysis of the HIMB11 16S rRNA gene sequence to those from cultured, sequenced roseobacters indicates that HIMB11 occupies a unique lineage that is divergent from the 16S rRNA gene sequences of Roseobacter strains already in culture (Figure 1). Based on the National Center for Biotechnology Information (NCBI) non-redundant database, the HIMB11 16S rRNA gene sequence is most similar (~99% nucleotide identity) to a large number of environmental gene clones obtained from various marine environments that exclusively fall in the Roseobacter lineage of Alphaproteobacteria. 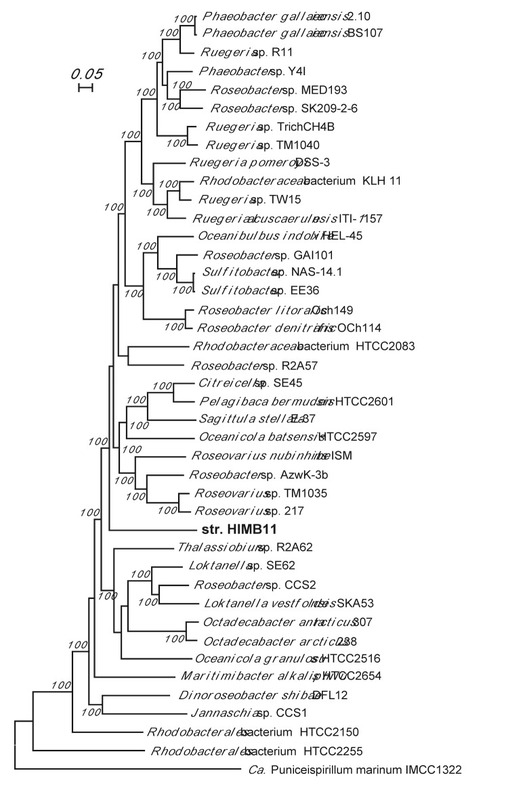 Phylogenetic relationships between HIMB11 and bacterial strains belonging to the Roseobacter clade. SSU rRNA gene sequences were aligned with version 111 of the ‘All-Species Living Tree’ project SSU rRNA gene database  using the ARB software package . The phylogeny was constructed from nearly full-length gene sequences using the RAxML maximum likelihood method  within ARB, filtered to exclude alignment positions that contained gaps or ambiguous nucleotides in any of the sequences included in the tree. Bootstrap analyses were determined by RAxML  via the raxmlGUI graphical front end . The scale bar corresponds to 0.05 substitutions per nucleotide position. Open circles indicate nodes with bootstrap support between 50-80%, while closed circles indicate bootstrap support >80%, from 500 replicates. A variety of Archaea were used as outgroups. Maximum likelihood phylogenomic tree derived from a concatenation of 719 shared single-copy orthologous protein sequences from strain HIMB11, 40 other Roseobacter members, and the SAR116 clade member Ca. Puniceispirillum marinum IMCC1322 (outgroup) using the RAxML maximum likelihood method . After a reciprocal BLAST search  was performed for all possible genome pairs at the amino acid level using an E value of 10-6, orthologous genes in each of the genome pairs were identified using the MSOAR software , which assigns orthologs by considering both sequence similarity and gene context information. One genome was picked at random as the reference genome, and pairwise orthologs were linked to the reference. Values at the nodes show the number of times the clade defined by that node appeared in the 100 bootstrapped data sets. The scale bar indicates number of substitutions per site. Bootstrap values lower than 50% were not displayed. HIMB11 cells are short, irregular rods (0.3-0.5 x 0.8 µm) that are generally smaller in size than previously reported for other cultured Roseobacter strains (e.g. described taxa in Bergey’s Manual range from 0.5-1.6 – 1.0-4.0 µm)  (Figure 3). HIMB11 is likely motile, as the genes necessary to build flagella are present (e.g. fli, flg). Based on the ability of HIMB11 to grow in dark or light on a medium consisting solely of sterile seawater amended with inorganic nitrogen and phosphorus, and the absence any of the known pathways for inorganic carbon fixation, the strain is presumed to acquire carbon and energy via the oxidation of components of the dissolved organic carbon pool in natural seawater. Based on the presence of carbon-monoxide-oxidizing genes (i.e. coxL, forms I and II) [25,26] as well as bacteriochlorophyll-based phototrophy genes (e.g. puf, puh, bch) [27,28], HIMB11 is hypothesized to oxidize both organic and inorganic compounds as well as obtain energy from light . A summary of these and other features is shown in Table 1. Scanning electron micrograph of strain HIMB11. For scale, the membrane pore size is 0.2 μm in diameter. Strain HIMB11 was grown at 27 °C in 60 L of coastal Hawaii seawater sterilized by tangential flow filtration and supplemented with 10 µM NH4Cl, 1.0 µM KH2PO4, and 1.0 µM NaNO3 (final concentrations). Cells from the liquid culture were collected on a membrane filter, and DNA was isolated using a standard phenol/chloroform/isoamyl alcohol extraction protocol. A total of 50 μg of DNA was obtained. HIMB11 possesses genes for assimilatory sulfate reduction (cys) and for the metabolism of reduced, organic sulfur compounds (e.g. amino acids, DMSP). 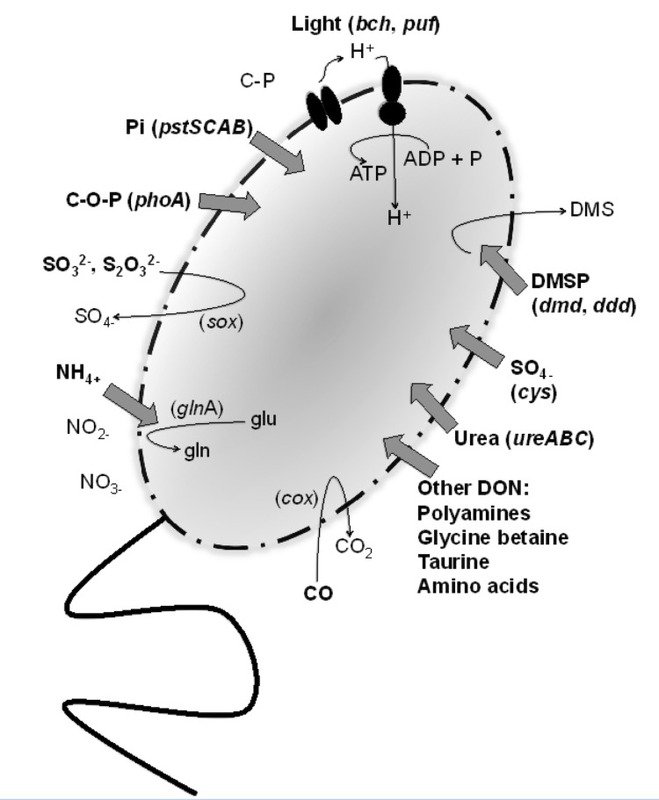 DMSP is an osmolyte produced by certain phytoplankton, including dinoflagellates and coccolithophores [44,45], and acts as a major source of both carbon and sulfur for marine bacterioplankton in ocean surface waters [46-49]. Roseobacters are frequently abundant during DMSP-producing algal blooms , and members of this group have become models for the study of bacterial transformations of DMSP . There are two competing pathways for DMSP degradation: the demethylation pathway that leads to assimilation of sulfur (dmdA, -B, -C, -D), and the cleavage pathway that leads to the release of DMS (dddD, -L, -P, -Q, -W, -Y) . DMS is a climate-active gas that has been implicated in the formation of atmospheric-cooling aerosols and clouds. The genome of HIMB11 harbors versions of both sides of the pathway (dmdA, -B, -C, -D’ and dddP, -D). We thank the entire C-MORE staff and visiting scientists for support and instruction during the 2011 Summer Course in Microbial Oceanography. Dr. Mary Ann Moran at the University of Georgia provided invaluable instruction on Roseobacter genomics and bioinformatic analyses. We gratefully acknowledge the support of the Gordon and Betty Moore Foundation, which funded the sequencing of this genome. Annotation was performed as part of the 2011 C-MORE Summer Course in Microbial Oceanography (Web Site), with support by the Agouron Institute, the Gordon and Betty Moore Foundation, the University of Hawaii and Manoa School of Ocean and Earth Science and Technology (SOEST), and the Center for Microbial Oceanography: Research and Education (C-MORE), a National Science Foundation-funded Science and Technology Center (award No. EF0424599). Garrity GM, Bell JA, Lilburn TG. Family I. Rhodobacteraceae fam. nov. In: Garrity GM, Brenner DJ, Krieg NR, Staley JT (eds), Bergey’s Manual of Systematic Bacteriology, Second Edition, Volume 2, Part C, 2005, p. 161. Garrity GM, Bell JA, Lilburn TG. Phylum XIV. Proteobacteria phyl. nov. In: Garrity GM, Brenner DJ, Krieg NR, Staley JT (eds), Bergey's Manual of Systematic Bacteriology, Second Edition, Volume 2, Part B, Springer, New York, 2005, p. 1. Garrity GM, Bell JA, Lilburn TG. Class I. Alphaproteobacteria class. nov. In: Garrity GM, Brenner DJ, Krieg NR, Staley JT (eds), Bergey's Manual of Systematic Bacteriology, Second Edition, Volume 2, Part C, Springer, New York, 2005, p. 1. Garrity GM, Bell JA, Lilburn TG. Order III. Rhodobacterales ord. nov. In: Garrity GM, Brenner DJ, Krieg NR, Staley JT (eds), Bergey's Manual of Systematic Bacteriology, Second Edition, Volume 2, Part C, Springer, New York, 2005, p. 161. Garrity GM, Bell JA, Lilburn TG. Family I. Rhodobacteraceae fam. nov. In: Garrity GM, Brenner DJ, Krieg NR, Staley JT (eds), Bergey's Manual of Systematic Bacteriology, Second Edition, Volume 2, Part C, Springer, New York, 2005, p. 161. Brandon M. High-throughput isolation of pelagic marine bacteria from the coastal subtropical Pacific Ocean. MS thesis. Univ of Hawaii at Manoa. 2006:p. 58.